There is a saying we have in Mexico that says: “Recado hace guisado”. That means that the end result of what you’re cooking depends on how well your tomato base sauce is done. “Recado” (or “recaudo”) can be raw, fried, or cooked like in this recipe. The ingredients are tomato, onion, and garlic. Recado is used every single day in Mexican households to prepare rice, stews, soups, etc. Some people don’t even know it has a name, they simply learned how to cook dishes using this sauce that is so essential in our cuisine. The most popular version is the raw salsa that is made in a blender and then poured in to cook with the rest of the ingredients. Here are a few examples of recipes using this salsa: Vermicelli Soup/Sopa de Fideos, Mexican Rice, Beef Soup/Caldo de Res, Meatball Soup, and Entomatadas, just to name a few. 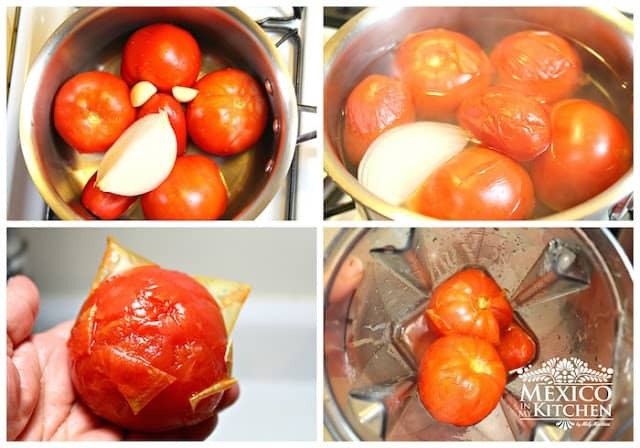 It’s a great idea to make some and freeze it or prepare it for canning when tomatoes are in season or if you find tomatoes on sale at the supermarket. 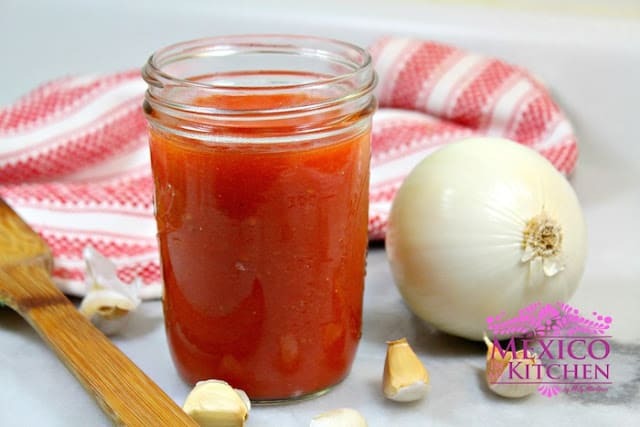 Carefully, place only the tomatoes, onion and garlic in a blender and puree until you have a very smooth sauce. Using a strainer, pour into glass jars. Once they’re completely cool, store in your refrigerator. The sauce will last about 4 days. Use as needed for your soups or other recipes. 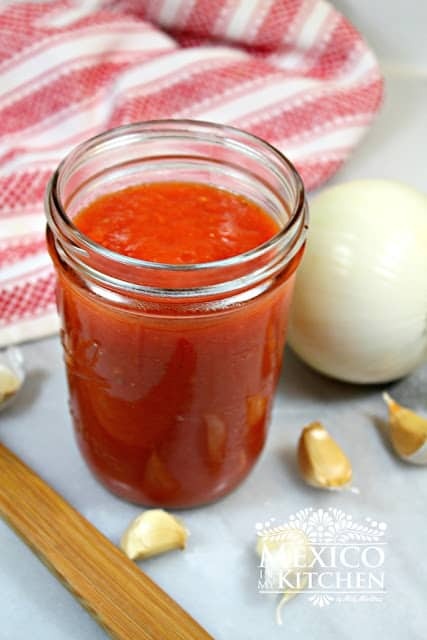 Basic Tomato Sauce, The ingredients are tomato, onion, and garlic. Recado is used every single day in Mexican households to prepare rice, stews, soups, etc. Some people don’t even know it has a name, they simply learned how to cook dishes using this sauce that is so essential in our cuisine. Place tomatoes, onion and garlic cloves in a large stockpot or saucepan. Cover with water, place the saucepan lid on, and cook over high heat until it starts boiling; once the water starts boiling reduce heat to simmer. Cook until tomatoes are soft and skins are peeling. You can use plum or round tomatoes to make this sauce. 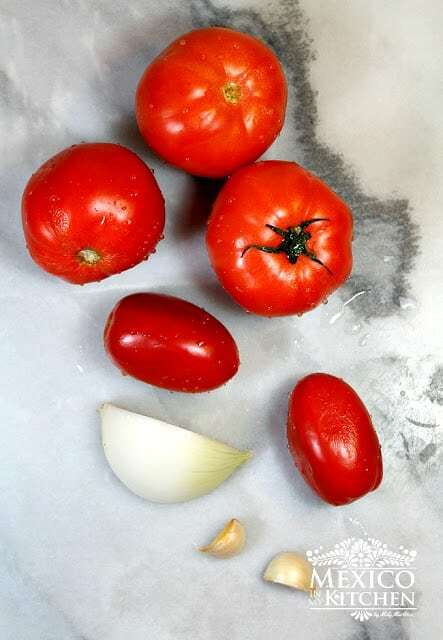 You can core the tomatoes and make a small “X” cut at the bottom of each tomato to easily remove the skins after cooking, once they’ve slightly cooled. I have a powerful blender so I skip this step. This sauce is also prepared raw and then fried with 2 tablespoons of vegetable oil in a frying pan until it is fully cooked. PS. Name a dish where you use this sauce in your cooking. Blended raw and fried I use this for fideo seco, sopa de cualquier pasta, arroz, sopas. The smell when it hits the oil is intoxifying. 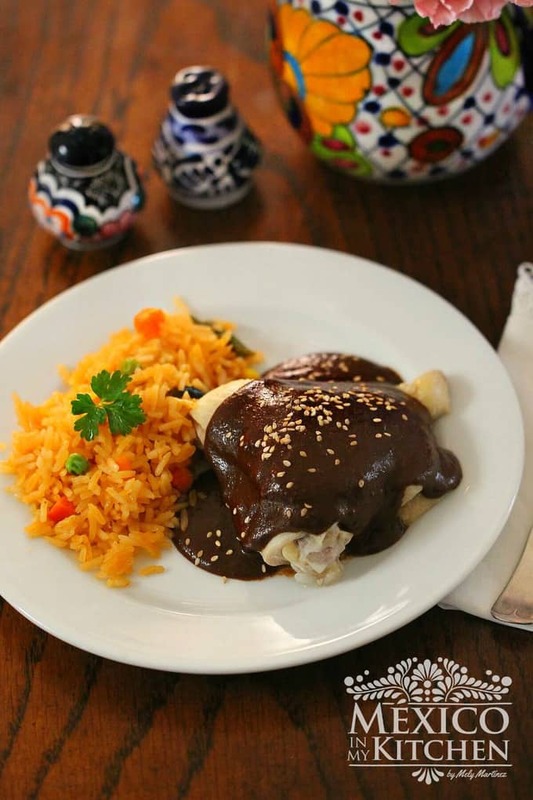 I’m going to make this next time I make Mexican Rice! I enjoy your recipes so much, thanks for sharing them! Yes, it can be frozen.